← Yet another Tragic Nightclub Fire! It is even more heartbreaking to learn that this tragic loss of life may have been needless and preventable. As more details of this tragedy begin to emerge, heartbreak turns to anger. While the details are still not known for certain, the more that comes out in the media the more this carnage appears to have been a preventable tragedy and a failure of regulation, enforcement and management. 1) From CNN we are told that the club’s license had expired in August 2012 and had not been renewed. We are also told that the owners had said that the club was properly permitted and had been inspected by the fire marshal. 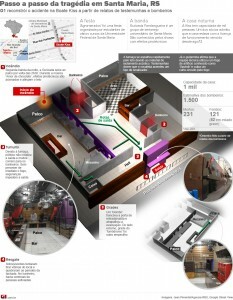 According to reports on CNN, a state fire official suggested that the maximum capacity of the club was 1000 people. This suggests that at least up to August 2012 the club had been considered appropriate and compliant with the local codes. 2) It has been reported in most media accounts that the club had only one exit. In some media accounts the word emergency exit has been used, which suggests that there may be at least two exits, while in other accounts it has been categorically stated that the club had just one exit. A schematic of the club on a Brazilian web site shows only a single exit (also see below). 3) Most recent reports suggest that fire and rescue officials estimate that there were 1500 people in the club at the time of the incident. 4) While it is still not confirmed, it now appears likely that the band did make use of pyrotechnics during their show, and this was a well known feature of the band. Reports have even suggested that they made use of three flares. It is not clear what is meant by a flare, but it is likely to be more than a sparkler! 5) All accounts so far suggest that the fire started in foam sound proofing and spread rapidly. However, the fire cause is not known at this stage. It may, as media accounts suggest, have been caused by the pyrotechnics, or it may have been caused by an electrical fault. We simply do not know at this stage. 6) The exit route was dark. 7) In none of the accounts that I have read is mention of a fire alarm sounding. 8) At first security guards thought that there was a fight or that people were trying to leave without paying so they initially blocked the exit. 9) Reports have highlighted that many bodies were found in the toilets. 10) Reports have suggested that at least one fire extinguisher failed to operate. Taking these points one can begin to ask some questions concerning the Brazilian fire safety regulations, the enforcement of those regulations and the quality of the management at the club. a) How could Brazilian building regulations (or the local code) permit a place of public assembly, with a reported capacity of 1000 people, to have only a single exit? Even though the license had expired and was under review, the club was considered compliant up to when the license expired in August 2012, so the exit capacity was deemed to be acceptable. Furthermore, what total exit width is required by regulation? With a capacity of 1000 people I would have expected at least three exits with a total exit width of at least 6m. b) It appears that no fire alarm sounded. Was this because the alarm failed or did the club not have an alarm? If the club did not have an alarm, how could the building regulations possibly permit this? Had an alarm sounded, perhaps the security guards would not have initially prevented people from escaping, possibly reducing the death toll. If the club had an alarm was it operational prior to the fire? If not, could this have been overlooked during a fire inspection? c) It is reported that the exit route was dark. Was there no emergency lighting in the club or did it fail? If there was no emergency lighting how could this be permitted by the regulations? Had emergency lighting been available, perhaps people would not have tripped in the exit path and perhaps people would not have mistaken the toilets for an exit route. If the club had emergency lighting was it operational prior to the fire? If not, could this have been overlooked during a fire inspection? d) What does the Brazilian code require in terms of emergency exit signage? Is this required? Had it been in place, perhaps so many people would not have mistaken the toilets as a means of escape. If emergency exit signage was required by law and it was in place, was it operational prior to the fire? If not, could this have been overlooked during a fire inspection? e) The fire appears to have started in the sound proofing foam that lined the ceiling and spread rapidly producing large amounts of toxic fumes. What type of foam was this? Was it protected in some way e.g. coated or covered with a fire resistive material? What do the Brazilian fire regulations say about the type of foams that can be used in places of assembly? If the use of foam is permitted, was the foam in place compliant with standards prior to the fire? If not, could this have been overlooked during a fire inspection? f) What do Brazilian regulations say about the use of indoor pyrotechnics? If like most countries they permit the use of such devices, what provisions are made to limit their use and ensure that they are used in a responsible manner? Concerning the use of flares, surely this cannot be permitted? g) Is it required by Brazilian fire regulations to regularly inspect mandatory fire fighting equipment? If so, what is the frequency? If regulations stipulate they are to be inspected, were the fire extinguishers in the club inspected prior to the fire? a) It is reported that the maximum occupancy for the club was 1000, yet fire authorities suggest that there could have been as many 1500 people in the club. What means did management have to ensure that the number of people in the club did not exceed their license limit? b) If the use of pyrotechnics are permitted under Brazilian code, what measures did the management have in place to ensure their safe use? c) It is reported that fire extinguishers failed to operate. Did the club management have the fire extinguishers serviced on a regular basis? d) What training did the club staff have in terms of fire fighting and crowd management? These are just some of the questions that need to be answered if the root causes of this tragedy are to be addressed. It is possible that this tragedy was no accident i.e. an unforeseeable event, but the result of a predictable and preventable failing of Regulation, Enforcement and Management. If so, then immediate measures must be taken to correct the failings in order to ensure a safer Brazil – let this be the legacy of the Kiss Nightclub victims. 1) Stop the use of pyrotechnics indoors, they are just too dangerous. 2) Inspection and enforcement must be taken as seriously as legislation. This entry was posted in Evacaution, Fire and tagged building evacuation, crowd dynamics, evacuation, fire, Kiss Nightclub fire, nightclubs. Bookmark the permalink. Many thanks for your comments. Glad to hear you find the blog of interest.